The Mustang GT Outlaw Edition was a package offered to Ford dealers in the South West. It was an appearance package built by Roush which consisted of Roush spoiler, dual stripes, hood scoop with special Outlaw graphics, and 17 or 18 inch black wheels. Have you ever seen one of these? 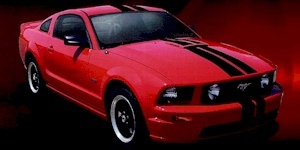 It's a Torch Red 2007 Mustang GT Outlaw edition coupe. This was a package available to South Western Ford dealerships. The cars were built by Roush on the Torch Red, Black, Performance White or Satin Silver coupes. Features include: Roush spoiler, dual stripes, hood scoop with special Outlaw graphics, and 17 or 18 inch black wheels.